Land pollution is the degradation of earth's land surfaces often caused by human activities and its misuse. Haphazard disposal of urban and industrial wastes, exploitation of minerals, and improper use of soil by inadequate agricultural practices are a few of the contributing factors. Also, increasing urbanization, industrialization, and other demands on the environment and its resources is of great consequence to many countries. The Industrial Revolution set in motion a series of events which impinged on the countryside destroying many natural habitats, and introduced pollution causing disease in both humans and animals alike. In some areas, more metal ores had to be extracted out of the ground, melted and cast using coal out of the ground and cooled using water, which raised the temperature of water in rivers. (This reduces the oxygen carrying capacity of the water and affects all the living things there.) The excavation of metal ores, sand and limestone led to large scale quarrying and defacing of the countryside. To a large extent this has stopped or is more closely controlled, and attempts have been made to use the holes profitably, that is, sand pits have been turned into boating lakes and quarries have been used as landfill waste sites. As the demand for labor grew, the areas round the factories and mines were given over to housing. This took up former agricultural land, caused sewage and waste problems, increased the demands for food and put pressure on farmers to produce more food. The demand for more housing meant the need to use more raw materials to make bricks, slates for roofing and timber for joists, etc. Once again this led to quarrying and to the destruction of forests. The houses also needed running water and a supply of energy. Initially this water would have been supplied directly from a stream but as demand increased the need for reservoirs increased. This again led to the loss of land as valleys were flooded to meet the demands. The main fuels used would have been coal and wood but as time progressed, hydro electric, coal, oil and nuclear power stations were built which again became features or eyesores on the landscape. Associated with this was the radiating network of pylons forming the National Grid, as well as, the sub stations and transformers. Until the late 1970s, little attempt was made to hide these metal structures but now more care is taken in their sitting and underground cables are often used—although these are not popular with repair crews who have to find faults and service them, often in very remote areas. This increase in the concentration of population into cities, along with the internal combustion engine, led to the increased number of roads and all the infrastructure that goes with them. Roads cause visual, noise, light, air, and water pollution, as well as using up land. The visual and noise areas are obvious, however light pollution is becoming more widely recognized as a problem. From space large cities can be picked out at night by the glow of their street lighting, so city dwellers seldom experience total darkness. On a smaller scale lights along roads can cause people living there to have interrupted sleep patterns due to the lack of darkness. The contribution of traffic to air pollution is dealt with in another article, but, suffice to say that sulfur dioxide, nitrogen oxides and carbon monoxide are the main culprits. Water pollution is caused by the run off from roads of oil, salt and rubber residue, which enter the water courses and may make conditions unsuitable for certain organisms to live. Haphazard disposal of urban and industrial wastes, exploitation of minerals, and improper use of soil by inadequate agricultural practices are all contributing factors to land pollution. As the demand for food has grown higher, there has been an increase in field size and mechanization. The increase in field size results in loss of habitat and shelter for wildlife. When crops are harvested the naked soil is left open to wind blow after the heavy machinery has crossed and compacted it. The increased use of chemicals (pesticides, herbicides, fungicides, insecticides) in farming has been damaging to the environment. Pesticides are any chemical used to remove pests whether they are plants or animals. They are used to kill wire worms and slugs that attack cereal crops and to kill ergot—Claviceps purpurea—a fungus that attacks crops and may get into human food. Herbicides are used to kill weeds, especially on pavements and railways. They are similar to auxins and most are biodegradable by soil bacteria. However one group derived from trinitrophenol (2:4 D and 2:4:5 T) have the impurity dioxin which is very toxic and causes fatality even in low concentrations. It also causes spontaneous abortions, haemorrhaging, and cancer. Agent Orange (50 percent 2:4:5 T) was used as a defoliant in Vietnam. Eleven million gallons were used and children born since then to American soldiers who served in this conflict, have shown increased physical and mental disabilities compared to the rest of the population. It affects the head of the sperm and the chromosomes inside it. Another herbicide, much loved by murder story writers, is Paraquat. It is highly toxic but it rapidly degrades in soil due to the action of bacteria and does not kill soil fauna. Fungicides are the group used to stop the growth of smuts and rusts on cereals, and mildews and moulds like Mucor on plants. The problem is that they may contain copper and mercury. Copper is very toxic at 1ppm to water plants and fish and can enter the skin if being sprayed to reduce mildew and accumulate in the central nervous system. Organomercury compounds have been used to get rid of sedges which are insidious and difficult to remove. However, it also can accumulate in birds’ central nervous system and kill them. Insecticides are used to rid farmers of pests which damage crops. The insects damage not only standing crops but also stored ones and in the tropics it is reckoned that one third of the total production is lost during food storage. As with fungicides, the first used in the nineteenth century were inorganic, for example, Paris Green and other compounds of arsenic. Nicotine has also been used since the late eighteenth century. There are now two main groups of synthetic insecticides. Organochlorines Organochlorines include DDT, Aldrin, Dieldrin, and BHC. They are cheap to produce, potent and persistent. DDT was used on a massive scale from the 1930s, with a peak of 72,000 tonnes used 1970. Then usage fell as the environmental problems were realized. It was found worldwide in fish and birds and was even discovered in the snow in the Antarctic. It is only slightly soluble in water but is very soluble in the bloodstream. It affects the nervous and enzyme systems and causes the eggshells of birds to lack calcium and be so fragile that they break easily. It is thought to be responsible for the decline of the numbers of birds of prey like ospreys and peregrine falcons in the 1950s—they are now recovering. As well as increased concentration via the food chain, it is known to enter via permeable membranes, so fish get it through their gills. As it has low solubility it tends to stay at the surface, so organisms that live there are most affected. DDT found in fish that formed part of the human food chain caused concern but the levels found in the liver, kidney and brain tissues was less than 1ppm and in fat was 10 ppm which was below the level likely to cause harm. However DDT was banned in Britain and America to stop the further building up of it in the food chain. However, the U.S. exploited this ban and sold DDT to developing countries who could not afford the expensive replacement chemicals and who did not have such stringent regulations governing the use of pesticides. Some insects have developed a resistance to insecticides—for example, the Anopheles mosquito which carries malaria. Organophosphates Organophosphates, for example, parathion, methyl parathion and about 40 other insecticides are available nationally. Parathion is highly toxic, methyl-parathion is less so and Malathion is generally considered safe as it has low toxicity and is rapidly broken down in the mammalian liver. This group works by preventing normal nerve transmission as cholinesterase is prevented from breaking down the transmitter substance acetylcholine, resulting in uncontrolled muscle movements. Entry of a variety of pesticides into our water supplies causes concern to environmental groups, as in many cases the long term effects of these specific chemicals is not known. A section of a landfill located in Barclay. 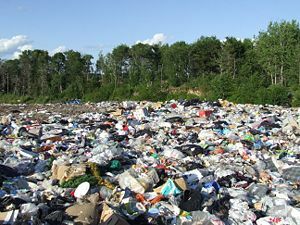 This is one of Dryden Ontario's Landfills. Throughout history, people have disposed of unwanted materials onto streets, roadsides, in small local dumps or often in remote locations. Prior to reforms within cities in the mid-to-late nineteenth century, sanitation was not a priority. The growing piles of waste led to the spread of disease. In the United States, to address the growing amount of waste the Solid Waste Disposal Act was enacted in 1965. In 1976 the Federal government amended the Solid Waste Disposal Act, creating the Resource Conservation and Recovery Act (RCRA), which requires a "cradle to grave" approach to the proper handling of potentially hazardous materials. RCRA gives authority to the Environmental Protection Agency (EPA) to regulate and enforce proper hazardous waste disposal. Many countries now have laws that require that household hazardous waste be deposited in a special location rather than sent to landfills with regular refuse. Household hazardous waste includes paints and solvents, chemicals, light bulbs, fluorescent lights, spray cans, and yard products such as fertilizers, pesticides, herbicides and insecticides. Additionally, medical waste generated at home is considered a hazardous waste and must be disposed of properly. Over the past century, the technology of military forces has increased. This has led to increased noise and aviation fuel pollution from air force bases, the destruction of land on army firing ranges and changes in coastlines to form naval bases. Beyond these conventional weapons, there have been developments in both nuclear and biological weaponry, with serious environmental consequences. For example, in World War II Anthrax was used as a biological weapon. In 1942, Anthrax bombs were dropped on Gruinard Island. However, the Anthrax spores on Gruinard persisted for 40 years until in 1986 the whole island was decontaminated by formaldehyde. ↑ The Department of Biodiversity & Conservation Biology, Land Pollution. Retrieved October 18, 2008. Snodgrass, Mary Ellen, Jody James, Janet Wolanin, and Vista III Design. Environmental Awareness: Land Pollution (Environmental Awareness). Marco, FL: Bancroft-Sage Pub., 1991. ISBN 0944280293. Tal, Alon. Pollution in a Promised Land: An Environmental History of Israel. Berkeley, CA: University of California Press, 2002. ISBN 9780585466514.
van Rooij, Benjamin. Regulating Land and Pollution in China, Lawmaking, Compliance and Enforcement: Theory and Cases. Leiden, NL: Leiden University Press, 2006. ISBN 9087280130. This page was last modified on 20 June 2018, at 14:51.